Oil markets will be keeping a close eye on the Red Sea after Saudi Arabia halted all shipments through the Bab el-Mandeb strait, following an attack on two of its very large crude carriers last week. The market will be looking for signs of whether the Saudis will reconsider their decision as the situation calms down. Elsewhere, results season for major oil companies continues this week. BP is set to report on Tuesday and Austria's OMV on Thursday. Results so far from the sector have mostly shown higher earnings following the jump in oil prices this year. Meanwhile, grains traders will be looking for signs of if and when Russian high protein wheat prices will hit $300/mt after the weather reduced the yield of good quality grain -- boosting the premium for high-protein wheat. Piers de Wilde talks about these and other updates on Platts Market Movers. In this week's highlights: Oil markets await BP's results; Russian high protein wheat prices poised for further gains; and coal traders eye low Rhine water levels. But first: Oil markets will be keeping a close eye on the Red Sea this week, as Saudi Arabia halted all shipments through the Bab el-Mandeb strait, following an attack on two of its very large crude carriers last week. The strait is a key chokepoint for shipments between Europe and Asia via the Suez Canal. The market will be looking for signs of whether the Saudis will reconsider their decision as the situation calms down. Elsewhere, results season for major oil companies continues this week, with BP set to report on Tuesday and Austria's OMV on Thursday. Results so far from the sector have mostly shown higher earnings following the jump in oil prices this year. Talking of jumps in prices, grains traders will be looking for signs of if and when Russian high protein wheat prices will hit $300 a metric ton after the weather reduced the yield of good quality grain -- boosting the premium for high-protein wheat. As you can see from the chart, prices have soared over $25 in the space of a month to around a 40-month high of over $220 a metric ton. That leads us to this week's social media question: How much further will Russian high-protein wheat prices climb? Tweet us your feedback with the hashtag #PlattsMM. Russia will also be the focus of the aluminum market this week. Russian billionaire Oleg Deripaska has until Sunday to divest his shares in Rusal, one of the world's largest aluminum producers. Deripaska is subject to US sanctions over his close links to the Kremlin. Rusal too has been hit hard by the sanctions because of Deripaska's involvement. How the issue plays out could have a major impact on near-term aluminum and alumina supply. Physical premiums could react sharply depending on the outcome. 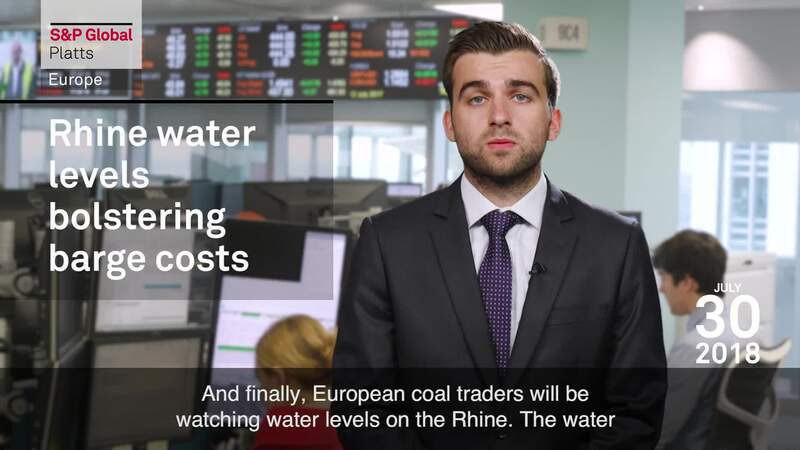 And finally, European coal traders will be watching water levels on the Rhine. The water is so low barges have only been loaded at 75% of capacity. Power utilities have been paying around 1 to 2 euros a metric ton more for barge shipments. However traders say they are not worried for now because margins for coal-fired power generation are high enough to withstand this.